Does Free Speech Apply to Employers and Social Media? Most of us know that employers in The Big Company monitor someone's social media activities. As is often the case, when someone expresses a personal view that is not politically correct, they can be screened out and barred from employment, and people have even lost their jobs for expressing themselves on social media. I disremember when I read this, but someone said that it was good and right for The Big Company to monitor someone's activities. Really? We may cry "censorship" or "freedom of speech", but those do not apply so much here. That is, try to fight it in court on "free speech" grounds, and you'll probably lose. Your speech is regulated while on the company clock, vocal or written, and what you write can be monitored even though it's on your own time, on your own media accounts. There are companies that don't really care what the typical employee does in his or her spare time as long as they do not claim to be representing The Big Company. That seems fair. My personal policy on social media is that people don't need to know where I work. This was brought home to me when a furious atheist on Twitter took exception to what I was saying, found out where I was working (my Linked In account was visible to the public back then), and said he was going to call the boss at The Big Company where I worked back then (and I mean big, a mult-million dollar corporation), and get me fired. Although they wouldn't care, they didn't need the nuisance, even if he did make contact. An upset employee was badmouthing the customers ("*** idiots") of the company where she worked. Someone reported it, she was confronted, and fired. There have been times where people would post pictures and comments about co-workers, and lost their jobs. Freedom of speech? Not hardly! In addition, ridiculing The Company and its products, leaking proprietary information, and more are likely to get you terminated. In such cases, I agree with companies, big or small, who remove employees who embarrass them in that way, and who harass co-workers. People can get fired for being stupid with their Weblogs. Getting fired for attempts to unionize, whistleblowing, and similar things are embarrassing to companies, but (as Remo says), "That's the biz, sweetheart!". Termination for such activities is illegal, and companies are setting themselves up for not only legal action, but potential lawsuits, since whistleblowing is not only legal, but in the public interest. Also, interfering with forming a union is illegal. Of course it is, unions are primarily outposts for the leftists in America these days! People set up sites, Weblogs, and other things separate from The Big Company for their personal views. 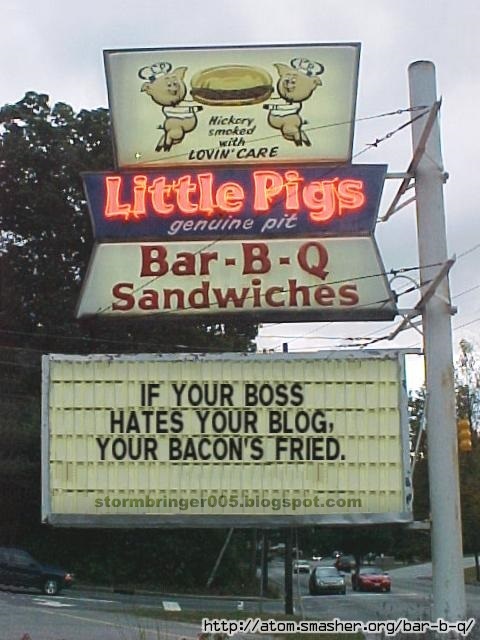 Sometimes, being fired for blogging is illegal, but there many factors to consider. People have been fired for expressing themselves on social media, on their own time, with their own equipment. This is one reason to consider using aliases, since the laws on being fired for your social media activities are muddled, and often difficult to enforce in the individual's favor. Many times, I have come across Weblogs that have a disclaimer that resembles, "The views expressed here are my own, and do not necessarily express the views of my employer". Sometimes, the employer is named ("...the views of my employer, Pernicious Whatzit Widgits" or so), which I'm not sure is such a good idea. The Web is replete with examples of people who were fired for expressing their views — especially Christians. For example, newspaper editor Bob Eschliman was fired for writing Christian views against the Gaystapo and the Queen James Bible. I've seen similar examples where people expressing their views and not mentioning their employers lost their jobs. We all know that companies are in business to make money. Some businesses care excessively about their image, so they slap leather with employees who express politically incorrect views. Atlanta Fire Chief Kevin Cochran wrote a book for a men's Bible study in his church. It had a short section about how homosexuality is in opposition to the Bible, and the Gay-K-K found out about it and had him fired. "Tolerance", my joyfully bouncing buttocks! I took a big risk by posting my article about homosexual "marriage" and the Bible on Weblogs, and my current or prospective future employers may not cotton to it. But it has no bearing on how I perform my job as a venomous snake wrangler at Pernicious Whatzit Widgits. Even so, laws or not, relevance to job performance or not, persecution of Christians is increasing. Saying that homosexuality is a sin and needs to be repented of just like all other sins (1 Cor. 6:9-11), saying that observable scientific evidence refutes evolutionism and supports biblical creation models, saying that Islam is a false and violent religion, saying that Jesus is the only way to salvation (John 14:6, Acts 4:12) — those can get me, and others, fired. In my case, it's unlikely, but possible. For other people, it is very possible, and I hope they check the links above for resources and information that may provide legal recourse. People in high-profile positions may do well to use pseudonyms for their personal Weblogs, social media, and so forth. Greed is eternal, and persecution is increasing. But Jesus is still enthroned in Heaven, is coming back in the final Judgement, and wins in the end.